The Chow-Chow is considered a descendant race of primitive ancestors. 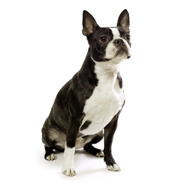 It is probably one of the oldest breeds of dog. In fact, it is so ancient that it is difficult to trace its origin precisely. Its appearance seems to date back to 3,000 BCE, a very obscure time period. It apparently descends from the “war dogs” which accompanied the Mongols and Tartars when they invaded China. The literature suggests that these dogs looked like lions and that they had blue tongues. 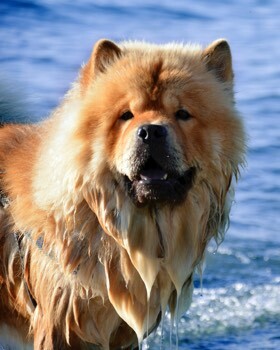 This is a feature that the Chow-Chow has kept. The Chow-Chow was an excellent hunting dog and a good guardian. It guarded and protected Tibetan temples and Imperial palaces for centuries. It was the perfect guardian, since it also protected monasteries and camps. 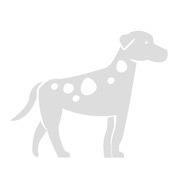 In China, it was a dog that was part of the elite and of the aristocracy. The Chow-Chow arrived in Europe around 1865. It was in England that the first specimens were imported. They were offered to Queen Victoria, who quickly developed a great passion for the breed. She took her Chow-Chow with her everywhere. Chow-Chows are often terribly stubborn. The Chow-Chow is an independent, calm and loyal dog. It makes an excellent guardian because it has a great protective instinct. 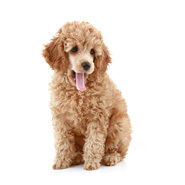 It is a naturally clean dog, and its toilet training is simple. It has a more feline personality than many other dogs. The Chow-Chow is a rather unique dog. It is independent and can sometimes seem cold and distant, even though it loves its master. It is also proud and reserved and rarely offers affection. It does not play much and does not really get along with children if they are rowdy or noisy. It is also not very social and dominant. Its protective instincts make it distrustful of people it doesn’t know. It can also be aggressive with other dogs. As such, it needs to be socialized at a very young age. Being rather stubborn, it is not easy to train and its upbringing must be based on a respectful relationship in order to create a good partnership. The Chow-Chow is a compact dog with short loins, and well-proportioned. It has a leonine appearance with a curled tail carried over its back, like the other races of the Spitz group. It has a short, stilted gait. Stop: little or not pronounced. Nose: large and wide. 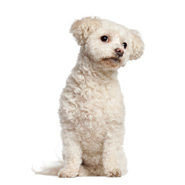 Black, except among cream-colored or nearly white dogs, who may have a lighter nose. For blue and fawn dogs, nose colors that are the same as their coat are allowed. Black noses are, however, preferable. Muzzle: moderately long, wide from the eyes until the tip. Lips: black, just like its palate and tongue. A dark blue tongue is preferable. 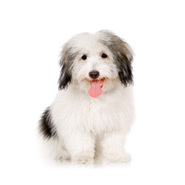 Dilution is stronger in white and cream-colored dogs. Jaws and teeth: strong jaws, articulated in perfect scissors. Strong and tidy rows of teeth. Eyes: dark and oval. Average height. With blue and fawn dogs, eye colors that are the same as their coat are allowed. 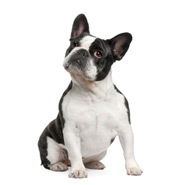 Ears: small, thick, slightly rounded at the tip. They are carried upright, rigidly, and well-apart. They point toward over the eyes and are slightly convergent. 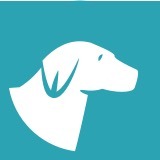 They give the dog a characteristic “scowling” expression. Strong, full, but not short. It is well set in the shoulders and slightly rounded. It must be of sufficient length to allow the head to be proudly carried above the line of the back. Back: short, horizontal and strong. Chest: broad and deep. The ribs are well sprung, but are not barrel-shaped. Elbows: equidistant between the withers and the ground. Hocks: far down. The hocks should be straight and strong, never bent forward. Any discrepancy from the descriptions set forth above will be considered a defect which will be penalized according to the seriousness and consequences which they have on the dog’s health. Males should have two normal-looking, well-descended testes in the scrotum. Walt Disney supposedly offered a Chow-Chow puppy to his wife Lillian for Christmas. He packed it in a box and placed it under the tree. This was apparently his inspiration for the famous scene in the Lady and the Tramp, when Jim Darling gave his wife Darling a puppy. 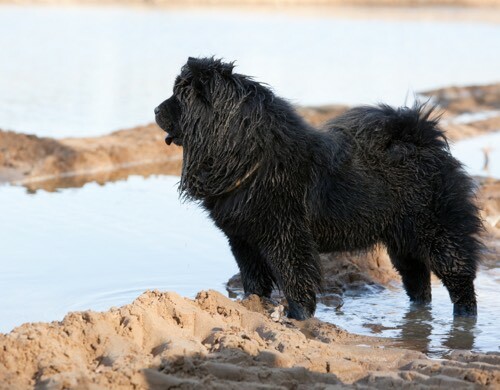 Chow-Chows can have either long or short hair. Long hair: it is abundant, dense, straight, and stands up. It has a rough texture with a soft, woolly undercoat. The hair is particularly dense around the head where it forms a kind of mane. It also forms bags at the back of the thighs. Short hair: it is abundant, dense and straight. It is not flat, and stands up. It has a fluffy texture. 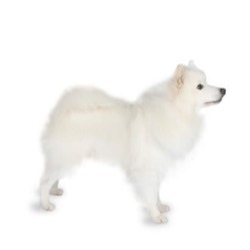 And artificial shortening of the hair, thus modifying the Chow-Chow’s natural silhouette will be penalized. There are different coat colors. Single-colored coat: black, red, blue, fawn, cream, or white. Single-colored coats are often nuanced but not spotted nor multicolors (the underside of the tail and the rear parts of the thighs are often lighter in color). Chow-Chows need very regular care. Brushing should be done almost daily for long hairs to avoid the formation of knots. For short hair, a quick brushing once a week is sufficient. The most common Chow-Chow coat colour is fawn. 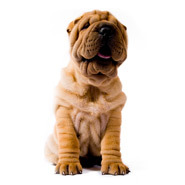 Sturdy, but predisposed to certain diseases such as hip or elbow dysplasia, skin problems, etc. It cannot stand the heat. It can get along with kids as long as it isn’t mistaken for a rag doll. It doesn’t get along very well with loud or highly active children. Is the Chow-Chow easy to live with? It can easily live in an apartment and adapts well to cities. 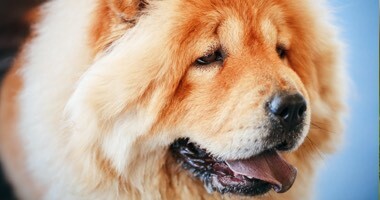 The Chow-Chow’s owner must persevere, because Chow-Chows are fairly independent and stubborn dogs. They cannot be trained, they are tamed. They are better suited to quiet types. No thread found for this breed.